Our #1 Selling Entry-Level Exam Prep Book! WHY IS THIS FIREFIGHTER WRITTEN EXAM BOOK UNIQUE? Many of the firefighter written exam books on the market today have from 4-5 practice examinations covering an assortment of testing subjects. Over the years, our students who were preparing for firefighter exams came to us with a concern that they must sift through each of these examinations to determine which questions are pertinent to the upcoming exam they are taking. 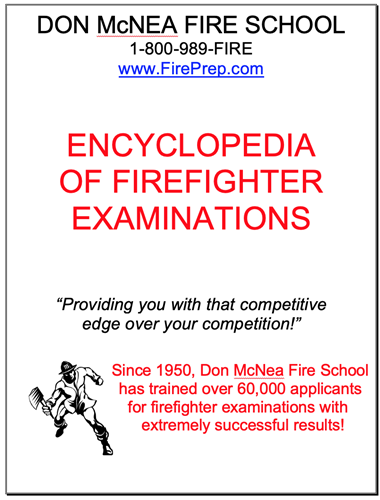 What makes the Encyclopedia of Firefighter Examinations unique is that it is divided into 16 testing subjects common to today's 21st century firefighter examination. For example, a fire applicant who is taking an examination on reading comprehension, math, human relations, deductive reasoning, and visualization can go to those specific sections in our book, read our high scoring test-taking strategies before each subject, and then take the practice examinations. With this format, the fire applicant will be better prepared by concentrating on the specific testing subjects for their examination.